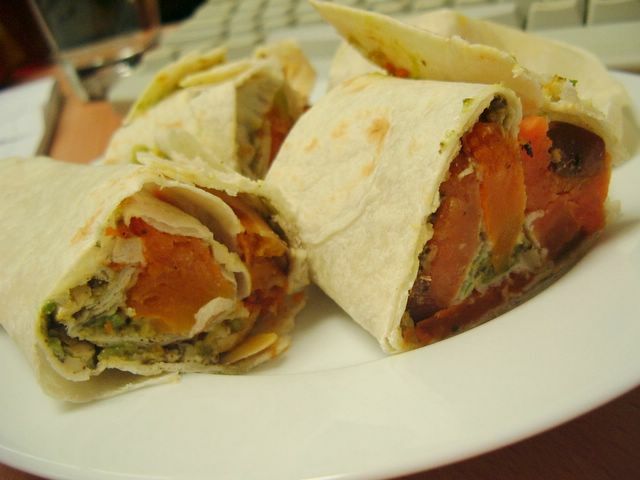 Weekday Lunch – Pumpkin & Feta Scroll – o frabjous day! This simple scroll is a pleasant alternative to a traditional sandwich, made on flat bread. If I wasn’t having anything else with it, I would add more vegetables, but it’s much easier to roll and transport with minimal ingredients inside. In the morning, lie out the round of bread, and spread it lightly with the pesto, feta spread, and avocado. Sprinkle the roast pumpkin pieces generously over 2/3 of the bread. Tightly roll up the bread, squashing down the pumpkin inside the scroll, and then wrap in sandwich paper. Before lunch, slice into small pieces, both for ease of consumption and pretty presentation. These look great, Cee. I’ve started finding some great Turkish flatbreads at my local Middle Eastern store but, once opened for dipping purposes, they generally don’t last very long. Must keep some back to try this though!